Many people celebrate Christmas in different ways. Some spend it with their family, some do charity work, some go on holiday and lounge on a beach or go skiing. Me? I spent my Per Noel at the location of one of the worst genocides in modern human history. The Choeung Ek Killing Fields. Obviously this wasn’t intentional, but the downside to extended travelling is that you do start to lose track of big events and dates. 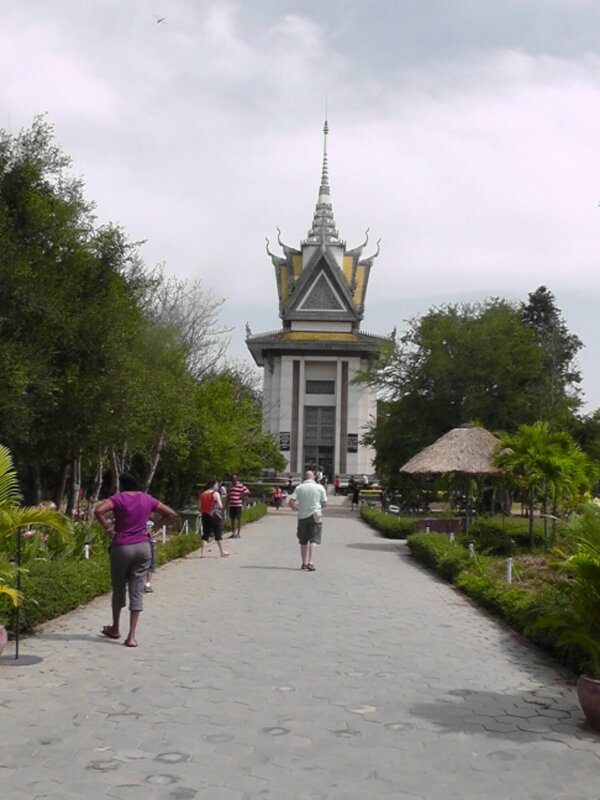 As such, the only full day I had in Phnom Penh was the 25th, and that meant I had to see the Killing Fields today. They’re quite a bit outside of the city centre, so I hired a tuk tuk to take me there, then to the Tuol Sleng Genocide Museum. Not a cheap trip, but by far the easiest way to go about it. This also gave me my first taste of Cambodian roads. They’re atrocious. Even more so when you’re in a tuk tuk with no suspension whatsoever (tuk tuks are basically horse drawn carriages pulled by a motorbike). To one side is brown dirt, to the other gravel. In the centre is a tarmac road, but its littered with potholes and poorly filled in repairs to little to none of it is smooth – and gets worse the further from the city you go. Not to mention the dust in the air from the dirt and gravel make glasses and face masks necessary for even the locals (when I came back my hair was caked in dust – shower water ran brown for a good 5 minutes). 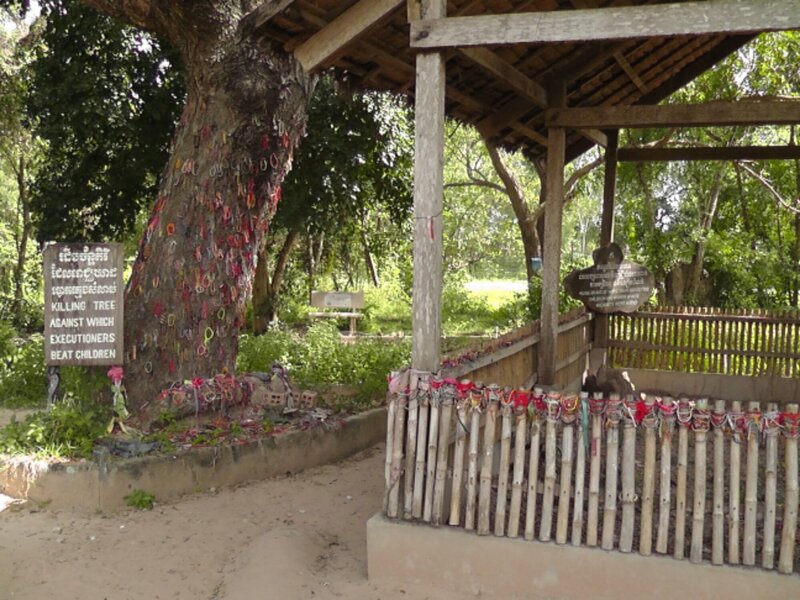 The Choeung Ek Killing Fields were once a Chinese graveyard, but during the Pol Pot era between 1975-1979, they became the site of mass murders by the Khmer Rouge. After being held at Prison 21 in Phnom Penh and admitting via torture of their crimes (most of which were lies) as well as innocents that were considered a threat to the communist plans for the country, men, woman and children were brought here for execution. Rather than bullets, which were expensive, they were killed with farming tools, knives and wooden sticks. Killing Fields exist all over the country, but this is the one most know – just under 9,000 skeletons have been found in mass graves, and many more remain buried. I didn’t have a tour guide for this centre, but everyone is expected to pay for the audio guide, which is an additional $2 and worth every penny. It includes not only descriptions of areas (which is helpful given that nearly all of the buildings were pulled down by the end of the war), but interviews and stories of Cambodians who lived through these years. The main structure is the stupa, which may seem very morbid to anyone going in blind. Its a tall building in the centre, which glass doors and windows along each side with 17 layers inside – displaying the remains found in the graves. The bottom layer is filled with their clothes, the next few layers with skulls categorised by gender and age, and further up are the other bones. 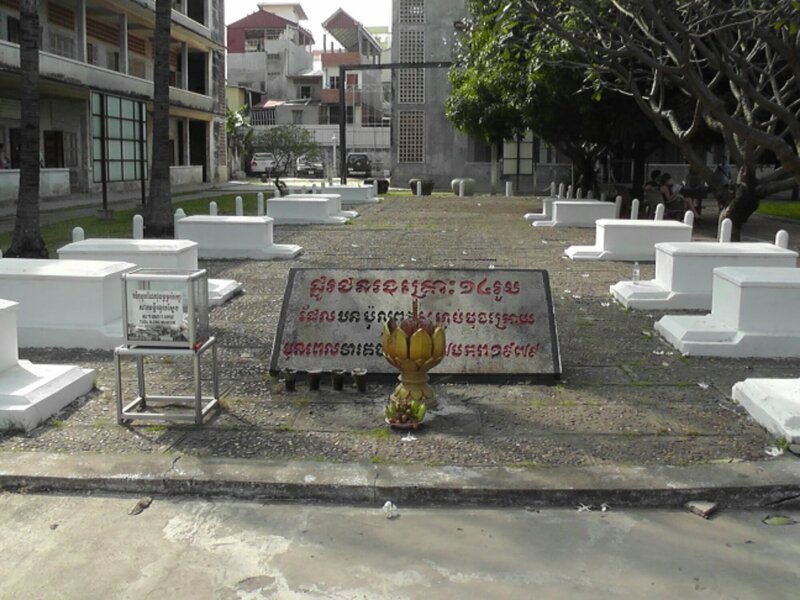 However this isn’t as macabre as you might think – Cambodians believe very strongly in honouring the dead, and making sure they have a place of respect when laid to rest – which adds an additional layer of horror to those who found the pits in the first place. It was a very sombre place to visit, much like a concentration camp. The genocides were only 40 years ago, and to this day, rain brings to the surface bone fragments and clothing from the victims. And the few pits (now thankfully empty) on display each have their own awful story. 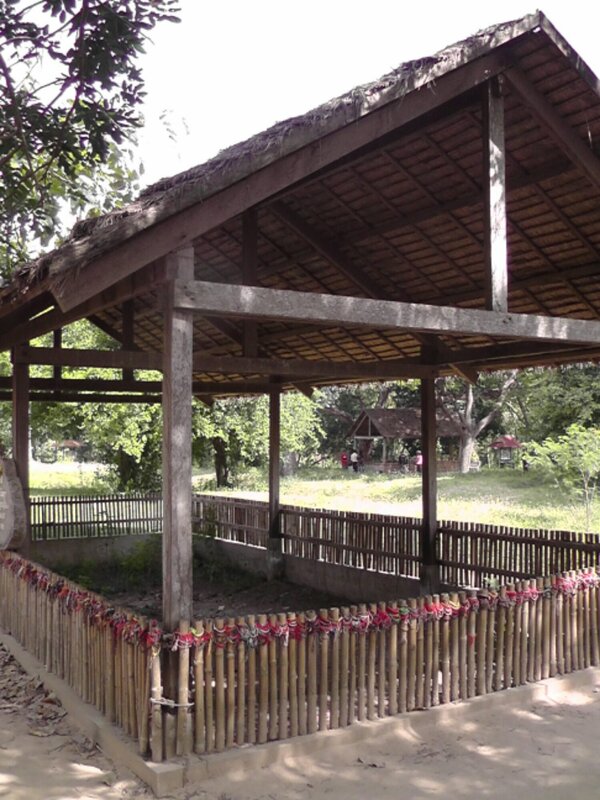 Including one that had been filled with mostly naked woman and children – right next to a tree that had been covered in blood and hair, from the skulls of infants smashed against its bark before being tossed in, and the grave filled with headless skeletons in Khmer Rouge uniforms – defectors or victims of Pol Pots paranoia. However, this trip wasn’t over. When I’d seen all there was to see, and listened to every story available on my guide, I returned to my tuk tuk and headed back into town for the next stop. Security Prison 21, where most of the victims of Choeung Ek came from. 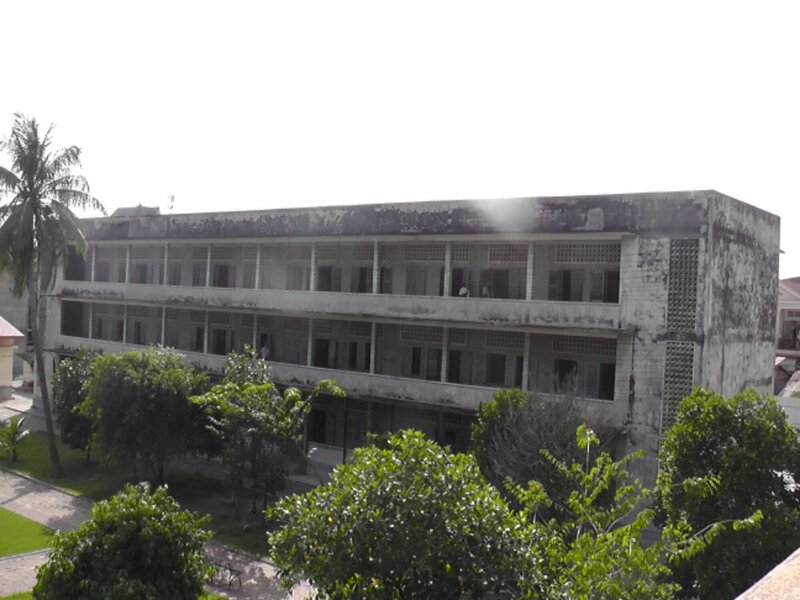 Now a museum designed to show the horrors performed by the Khmer Rouge, Tuol Sleng started its life as a High School. 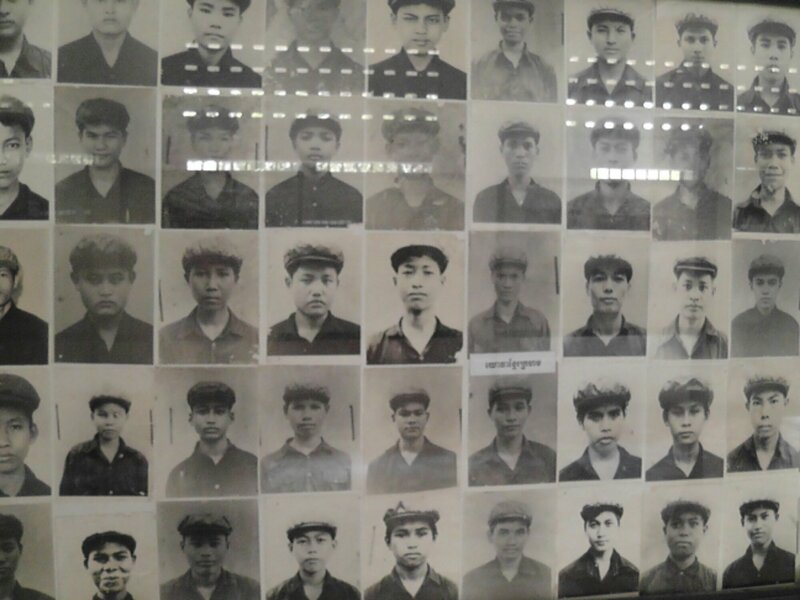 However, when Pol Pot came to power, and emptied Phnom Penh’s population to labour camps, the buildings were transformed into prison cells, where anyone considered a threat to the regime was brought. This included educated men and woman, foreigners, religious leaders, diplomats and in fact anyone who spoke out against the Khmer Rouge…as well as their families – if one member was suspicious, better to kill the entire family rather than leave someone alive to get revenge later on. When arrested, all prisoners would be photographed and would be expected to give a biography of their life from birth. However, although much of it would be true, they would be expected to also include details of when they joined the CIA, KGB or any number of other agencies to prove that they were a spy – and they would get that confession no matter what. Its believed that most of the people kept in this prison were innocent of their crimes. There are four buildings in the complex. 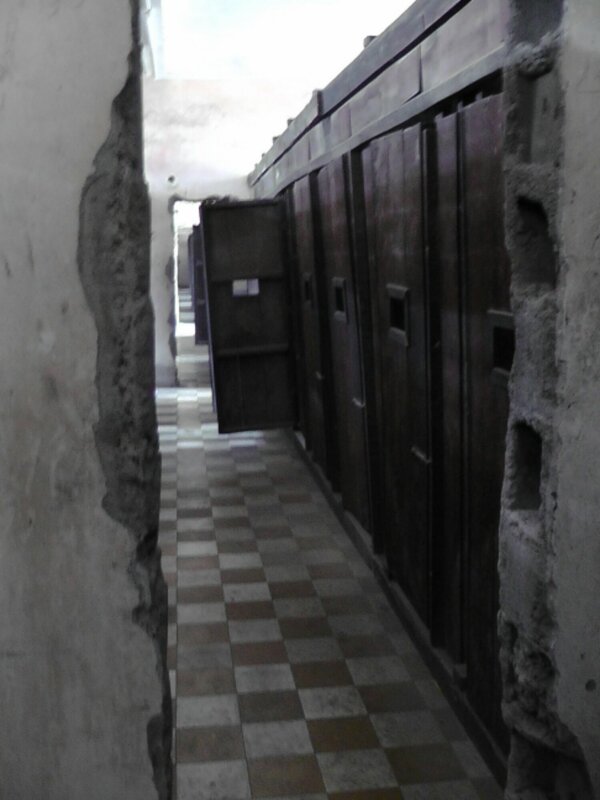 One has kept its classrooms their original size and would often be used for torture or for holding political prisoners. When the prison was discovered in 1979, 14 bodies were found in this building, decomposed beyond any recognition. These 14 are buried just outside. The second building held smaller cells, where prisoners would be forced to share tiny rooms. Made from cement or wood, the cells were tiny, and had little to no light or air. Prisoners would be hosed down every 4 days, which was the only bathing facilities they received. The other buildings held displays, including photographs of the prisoners (which due to photos and records being separated, are nearly all anonymous), and stories from the few survivors of this prison – as some were released rather than executed, as well as paintings depicting the torture prisoners would have to undertake. In the fourth building, there was also an exhibition in honour of the Battle of Okinawa too. In many ways, the prison was harder to walk through than the Killing Fields. Although the bodies remain at Choeung Ek, being outside and looking at the empty fields is a lot easier than walking through the hot dusty rooms, and staring at the thousands of photographs. Needless to say, I was really in the mood to do something a little more upbeat with my evening. When I got back to my hostel, while I was having lunch, the guys at the desk recommended that I do a boat trip along the river. It would leave at such a time that I’d see the day, sunset and then the night skyline. Trip would only be an hour, so I decided to go for it. As it turned out, an hour was a little bit of an underestimation – took closer to 2, and was a little less than enjoyable because the majority of people on the boat had paid to have a meal on the boat, so there was less socialising and more eating. The scenery was pretty great though. 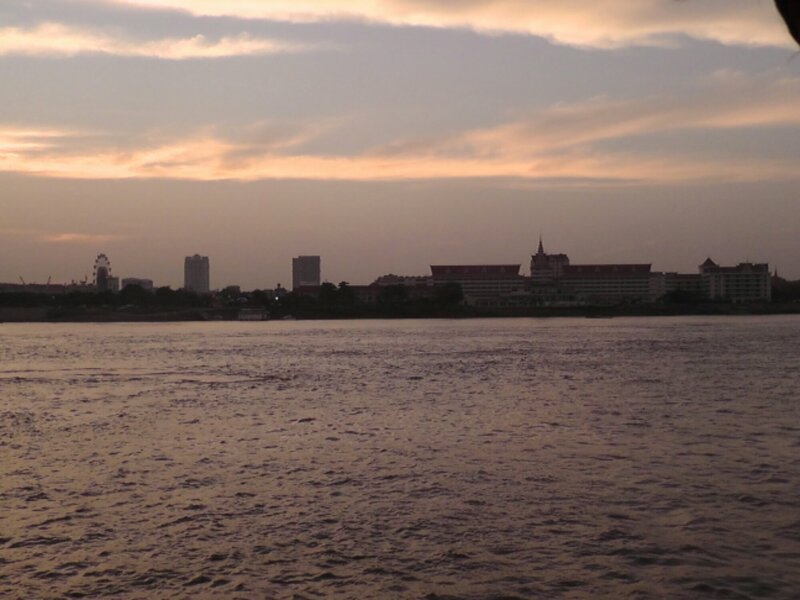 Phnom Penh looks like another city from the river. 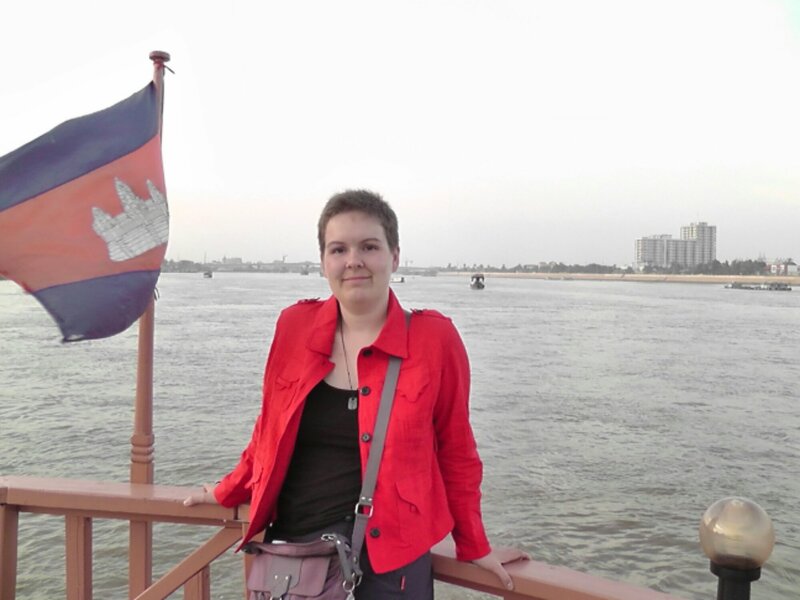 I really haven’t given it enough of a chance – although that was almost inevitable considering how much I loved Vietnam – anywhere else would be held to impossible standards just because. Will need to visit again. 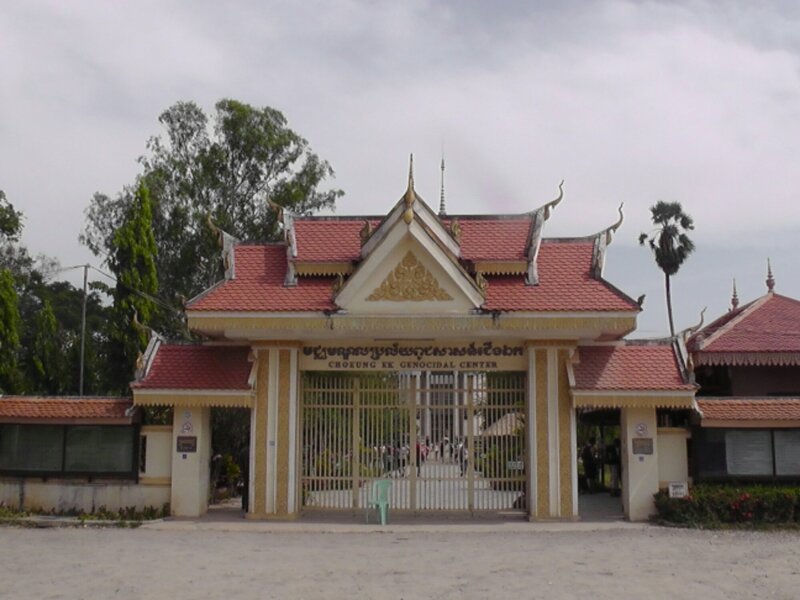 This entry was posted in Cambodia, Diary and tagged Cambodia, Choeung Ek Killing Fields, Genocide Museum, Me Mates Place, Phnom Penh, Security Prison 21, Tuol Sleng. Bookmark the permalink.